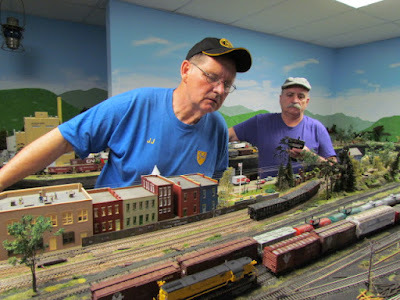 Where Do Old Railroaders Go? 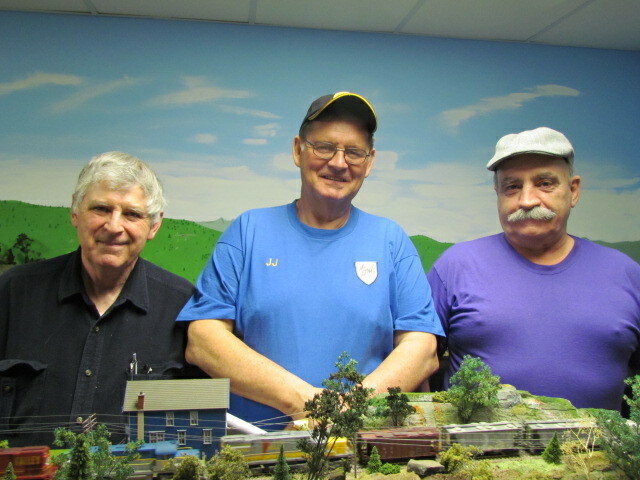 I was very happy to have a couple of my old railroad crew join us for train night. It is hard to compare model railroading with real railroading but I thought JJ and Al fit right in last night. Rick ran the afternoon yard while Kip was engineer on the Podunk Mine Job. Kip sure gets serious don't he? Poor Don, he always gets stuck with the tough jobs. He smiles anyway. All in all I had a ball except I wanted to eat more of Ann Key's cookies. Dieting ain't no fun at all. I got the idea after a trip back through my magazine collection. Ideas for this type of detail enhancement were common during the "Wonder Years" of MR when Paul Larson was editor and the magazine had a connection to the prototype. 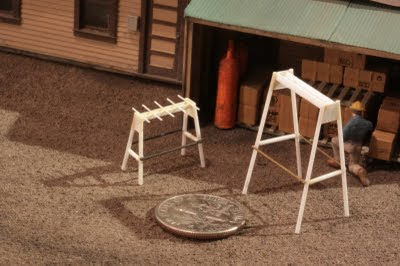 Paul's inclusion of "Closeup Prototype Ideas For Your Layout" always had neat stuff like this. My prototypes came from my own slide collection. D&H Hudson yard and NYC/PC/CR Kingston, NY engine house area. All you see is scratchbuilt except the chain. Getting the MU cables to sit at the right attitude was loads of fun. 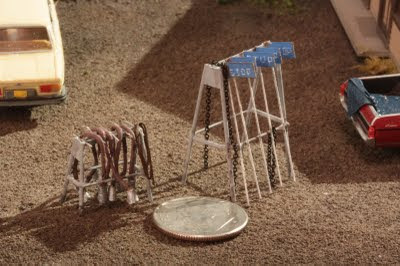 Both racks can only be handled with a tweezers. Do not attempt anything like this with ANY caffine in your system. I took a little time after lunch to railfan along the newly detailed section of r.o.w. at Lehigh Junct. 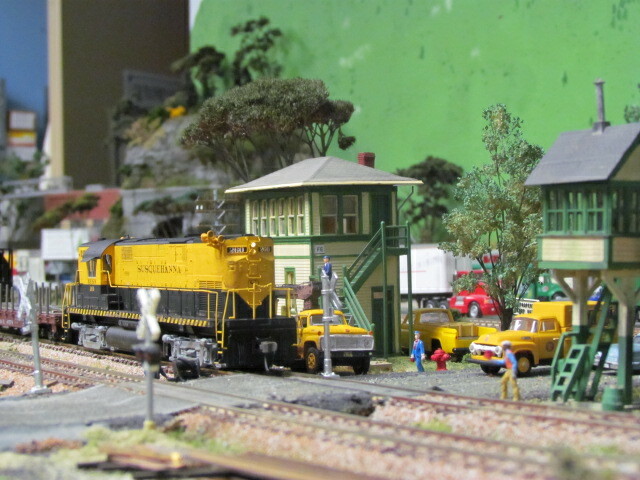 Like the correct mix of rolling stock and vehicles, you need a "right" mix of faux vegetation. Textures, colors, shades , etc. (you know all this). I'm trying for Late summer (September). Big difference now that I'm down to doing a square inch at a time! I guess we get our "fun" where we can. 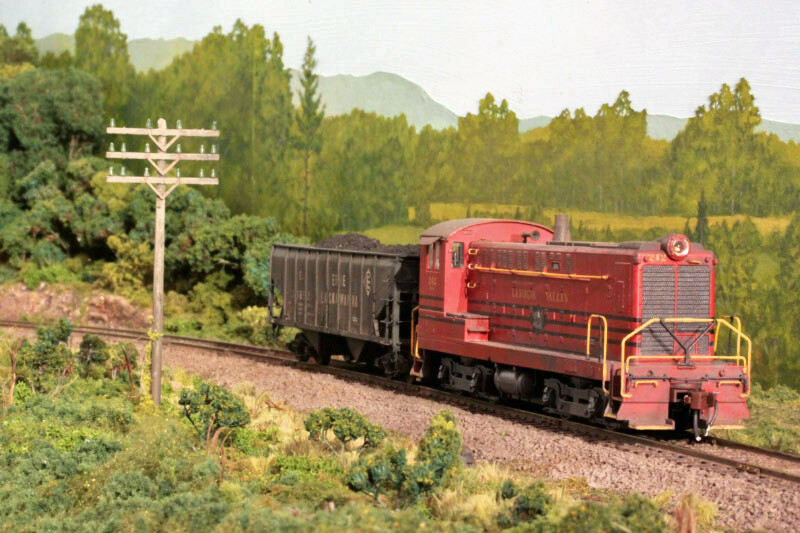 I had just turned on the scanner at the compound, and in so doing, picked up the last part of a conversation between dispatcher Gordy Smith and local train DS-11 switching the paper mill at Fort Ticonderoga. DS-11s crew was looking to head south, but were informed that 253 was just out of Whitehall with leader SOO 6057 and they would have to wait until 253 passed by. Now, I did'nt have time to take more than a step away from the scanner when I froze, listening to this conversation. I instantly knew what I needed to do. Get on the road and head for Plattsburgh! I had read of this trains power consist earlier in the afternoon in emails. A colorful Iowa, Chicago and Eastern SD 40-2 was one of the trailing units. Now I'm not a big believer in coincidences, so when an opportunity such as this pops up, I take the event seriously and try to take advantage of it. But, it's a two hour drive up around the north end of Lake CHamplain and down into Plattsburgh, and with 253 running north of Whitehall already the train may beat me to my spot! So.....overlooking breakfast for the time being, I make two thermoses of tea and head out. Enroute in Champlain, NY I break down and go all out for a quick breakfast, pre-packaged potato salad at the 24 hr. Price Chopper! Hey! At this point, you don't browse for cryin' out loud! You see something that resembles healthy.........you buy it and go. Thankfully there was no one at the register trying to decide which lotterry tickets they wanted! LOL! 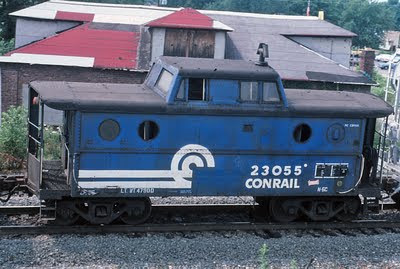 All the way over the D&H frequency is silent on the car scanner, and I'm thinking I've got 'em until.........maybe ten miles north of town I hear the Port Kent equipment detector go off, announcing the passing of 253. The detector is located perhaps eleven miles south of my spot at the station. This is not welcome news! LOL! I'm surely screwed at this point unless.........its not all that uncommon for 253 to pick up or set out cars at Bluff Point Yard on the south side of town, as they are the only northbound CP road freight. I hold out hope some of this time consuming switching is in the game plan for tonight! 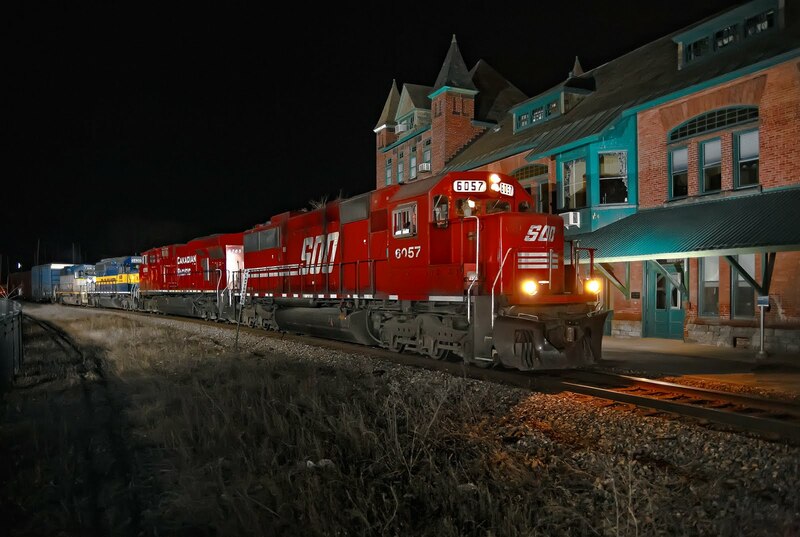 A few minutes Iater I arrive at the station to a wonderful sight, a dark approach lit signal! When 253 is north of Bluff Point Yard, that signal will be green. SO far so good! As I'm setting up the majority of the lights on the far side of the fence which runs down the left side of the scene, I can hear the crew making switching moves! Now I'm thinking......."you know Gary, this might work out after all!" With the recent addition of "the fence" separating the sidewalk running the length of the r.o.w. from Dock St. on the east, to the end of the new parking lot well out on the west side of the station, the appeal of shooting here increased with the extra hurdles involved with the seemingly convoluted move of driving down out of sight around the block and back up to the station side to get around the fence! All of this takes time, with a stop light governing a three way intersection to deal with, (always on, never blinking yellow of course.......) at 1 a.m. I consider just ignoring the red display, then I realize its friday, and I look down the street to my right and see a cruiser a couple blocks away watching the college kids around the bars. I settle back into my seat........yeah, I guess I can wait! LOL! And wait I would! After setting up the last of the lights, getting the stepladder and camera all set, it would be forty five minutes before the crossing signals lit up at Dock St. and SOO 6057 swung around the sharp curve over the crossing and towards me. This moment is when it is all worth it! I glimpse the ICE unit swinging into view third back, then I concentrate on the pilot of 6057 as it passes my spot, a silent "click", and the lighting comes through again! What a backdrop to shoot a train against eh? The last group of conventional cab equipped SOO SD 60s, painted in the "all red" scheme are a favorite model for me, so it is easy to overlook the lube oil spraying out from the hood doors and on the walkway! 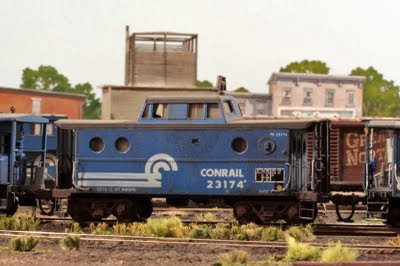 The surprise is the fourth unit back, representing the D&H in this family of CP owned railroads, here comes GP 38-2 7304 picked up at Bluff Point Yard off the DS-13 local job. 7304 last year sufferred bent connecting rods, and went off line out west to be appraised as we on the D&H held out hope for her return. To their credit, CP replaced the prime mover from a stored GP-38-2 and returned 7304 to service! 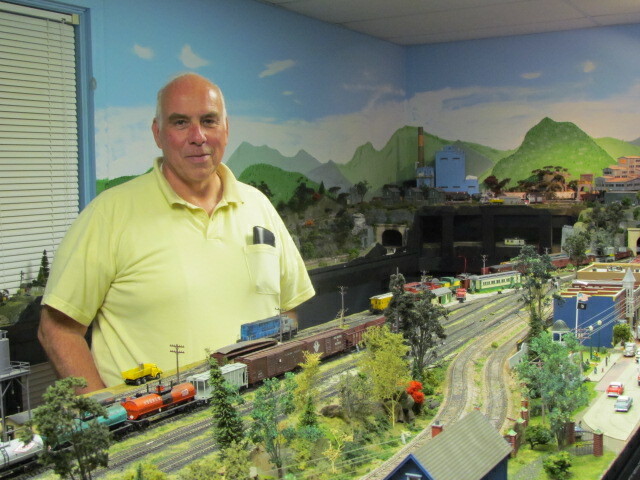 SO here we have a cross section of CP Rail in the midwest and east represented, with only the DM&E missing! Am I glad I turned that scanner on! Ha,ha,ha! 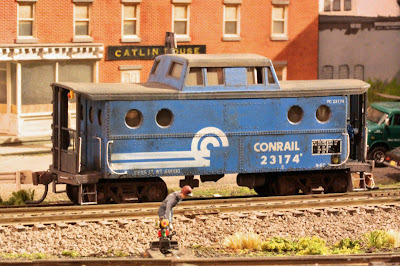 Shot in Plattsburgh, NY on APril 16, 2011 at 02:06 with the 5D and Zeiss ZF 28/2 lens. Please enjoy! Comments are welcomed. 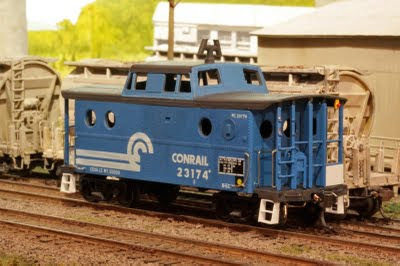 A few of us got to remembering that April 1st was the 35th anniversary of the formation of Conrail. We were swapping stories of what we rememberd from that time. It got pretty involved and interesting when we also started emailing slide scans from the 70's. I think I sent you some scans of old Mech'ville B&M slides that were from that digression. 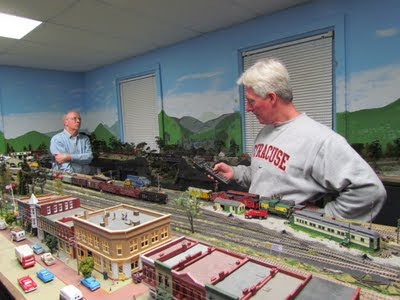 The Caboose model came about from a few of us taking things even further. We each agreed to build a model of a piece of CR equipment. My choice was this N5c caboose. The basis for my model was the Bowser kit for the classic Pennsy port hole N5c. I got one that was pre-dec so paint and decaling was avoided but, I did have to make a few changes for the sake of accuracy. Notably: The trucks had to be switched to rollerbearing leaf spring, the steps were different, the roof walk was eliminated and the window by the toilet was blocked and the vent added. 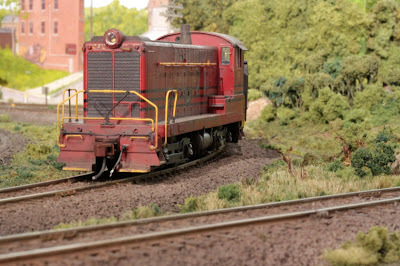 The other changes were for personal preference, those changes being the wire handrails and cut levers. The first image shows the modifications I made clearly.